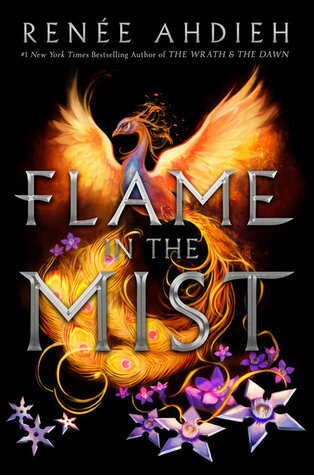 Flame in the Mist is brilliantly written, expertly weaving court politics, intrigue, and adventure against the backdrop of a Japan with just the hint of magic. Ahdieh's novel is impossible to put down, though it really got going for me in the last third. Still, I love that the characters in this are so multi-layered and complex, the romance is complicated and swoon-worthy, and the personal growth of the main character is a sight to behold. I really appreciate that our protagonist, Mariko, is privileged and wealthy and grows to accept and acknowledge that privilege as she experiences more of the world and sees her own life through an outsiders perspective. Yet, that being said, I felt like the first half of this novel predominantly featured Mariko insisting that she was intelligent and different, but never really proving or showcasing that. I like that she's a heroine who struggles to infiltrate the Black Clan because she isn't the most physically fit and, eventually, we do see signs of her intelligence take shape, but it takes awhile. As a result, I think I felt distanced from her, at least in part, and I didn't really get into this book until the second half. With Ahdieh's debut duo, I sank my teeth into her world and characters without a doubt, but this time around it took awhile. Nevertheless, I am confident the sequel is going to surpass this novel and I'm really looking forward to seeing where this story is headed. I want to see more of the magic I've seen hinted at in the novel and I definitely want to see all the court intrigue and politics intersect with Mariko's own story arc. Recommended, as with all of Ahdieh's novels. I was really hoping this would be a bit more but either way, I definitely think I will be reading this. I really hope the second book is better. Hmmmm. I definitely see what you're saying, about Mariko telling how badass she is, but not quite showing it (in the first half). Like you said, I'm sure the sequel will be better. I feel like there are a lot of things that Ahdieh hinted at but didn't address in this book, so I can't wait to see how things shake out, in the sequel! I enjoyed her debut duology as well so I'm a little disappointed about this one. If there's something that turns me off is the all talk no game character in a book. I might hold off on reading this one. I'm really interested in picking this one up. I don't know when I'll get to it, but I'm glad that you liked it. Great review! I really struggled with this book Keertana, I actually tried twice before putting it to one side, my sister like you really liked it though, and keeps insisting I give it another go. Thanks for the heads up that it took you until at least halfway to get into it, because of this I may even end up giving it another go one day! Another great post Glad to read your post. Thanks for sharing your opinion about the book. I love to read novels and usually eBooks download online to read all my favorite short novels.